John Kenneth Muir's Reflections on Cult Movies and Classic TV: Doctor Who: "The Ark in Space"
Doctor Who: "The Ark in Space"
The fourth actor to portray the famous time traveling "Doctor," Tom Baker followed on directly from the Jon Pertwee years, a span wherein -- for a substantial stretch of time -- the renegade Time Lord from Gallifrey was trapped on 20th century Earth, unable to explore the universe. That travel ban had been lifted previous to Baker's arrival (following the anniversary celebration, "The Three Doctors), but "The Ark in Space" represents the fourth Doctor's first foray away from terra firma; and a harrowing one at that. 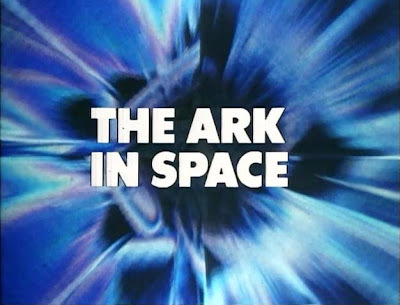 "The Ark in Space" is also an early and prominent example of producer Philip Hinchcliffe's new template for the long-lived series, one that involved a dramatic shift towards more overt horror territory. Indeed, seasons 12 through 15 of Doctor Who --which still represents a kind of golden age for the classic series -- presented one outer space horror-themed serial after another, with titles such as "Terror of the Zygons," "Planet of Evil," "The Pyramids of Mars," "The Brain of Morbius," "The Seeds of Doom," "The Masque of Mandragora," "The Hand of Fear, "The Face of Evil," "The Talons of Weng-Chiang," "The Horror of Fang Rock," and "Image of the Fendahl." In these tales, the universe itself seemed to take on a new, distinctly mysterious and dark aura. There was a strong Lovecraftian angle to the series at this juncture, as monstrous gods (Sutekh), species (The Fendahl), and personalities (Morbius) threatened to arise from centuries-long slumber, or even from entrapment in the ice (Krynoid) to threaten mankind and the universe at large. "The Ark in Space" expertly sets that terrifying tone for this new concentration on horror, and does so from the inaugural shot; a point-of-view perspective shot that reveals some kind of green-slime-covered monster attacking a sleeping human inside a suspended-animation chamber. Aboard the T.A.R.D.I.S., Doctor and his two companions, Sarah Jane Smith (Elisabeth Sladen) and Harry Sullivan (Ian Marter) set down near the site of the attack, on a seemingly abandoned "artificial satellite," the space station called Nerva. The station is an example of "30th century construction," and the time/space travelers quickly discover that Nerva is also a "cryogenic repository" warehousing the survivors of the human race. These poor souls have been asleep for some 5,000 years, following solar flares which devastated the surface of Earth. Now, the "entire human race" awaits "a trumpet blast," to wake up, start over again, and re-populate the healed planet. "What an inventive, invincible species! It's only been a few million years since they crawled up out of the mud and learned to walk. Puny, defenseless bipeds. They've survived flood, famine and plague. They've survived cosmic wars and holocausts. And now, here they are, out among the stars, waiting to begin a new life. Ready to out-sit eternity. They're indomitable. Indomitable." However, those future pioneers of Earth now have a big problem. An alien race called the Wirrn that the Doctor likens to "galactic wood worms" has infested the station. The Wirrn swarm once lived in the Andromeda Galaxy but their "Old Lands" were seized by space faring human beings, and the giant bugs have been looking for a new home ever since. Not to mention revenge. Again, consider how the discussion of "Old Lands" and the resurrection/return of an ancient evil resonates with the Lovecraft template. The Wirrn plan to utilize the sleeping human race on Nerva as their primary food source, and more. When they digest life forms, the Wirrn also absorb the knowledge of all such life, and so plan to become a "technological species" within one generation. As his wont, the Doctor has once more stumbled into an inter-species battle for survival, and must pick a side for which to fight. Given his history, and the affirmative quotation regarding mankind above, it's not too difficult to guess where his loyalties fall. But one delightful element of "The Ark in Space" is that it isn't simply a serial about man vs. alien, or the Doctor racing to the rescue; much like the proverbial Time Traveler negotiating the breach between the Eloi and the Morlock. On the contrary, this Doctor Who serial comments on an intriguing trend in the 20th century workplace that began in the 1970s and probably reached its peak in the mid-1990s. In this tale by Robert Holmes, the future humans in suspended animation are all workers with very specific assignments. They are specialists, able to perform with great talent their assigned duties, and only their assigned duties. They are advanced technologically, quite bright, and yet also rigid. One woman named Vira (Wendy Williams) is a physician; the man named Noah is a leader, and so on. But beyond their specialties, these examples of future man are lost; diffident and vulnerable. In real life, the debate was whether or not workers would be more productive simply doing one task, or multi-tasking. In the Recession of the early-to-mid 1990s, the trend towards specialization largely faded out and multi-tasking -- the performance of multiple tasks by one person -- carried the day. With layoffs and an epidemic of "down-sizing" (a new term in the 1990s) workers had to prove their flexibility and worth to companies looking to cut and slash. "The Ark in Space" debates this issue, in the process considering every shade of each argument. Vira is designated a physician, but when Noah, the team leader, is absorbed by the Wirrn, she must step up to the plate and take command. It is not her nature, and it's not her "job description," but fate has made these arrangements for her. She will either grow...or fail. And if she fails, the human race fails. The Wirrn represent a strong contrast to the trend of specialization in the work place: they gain knowledge easily, through biological absorption and can pick up new talents, skills, and data without re-education or any personal learning whatsoever. They need only to...consume talented individuals to grow and fatten and prosper. Because they are an insect culture, the Wirrn are also a hive mind. And another word for that, of course, is "corporate entity." So make any comparisons you wish there, between business executives and parasitic insects. They are the "users" of the workers, who end up on top by "absorbing" the talents of those they exploit. The more closely one studies "The Ark in Space," the more fully this debate about specialization in the human animal bubbles through to the surface. 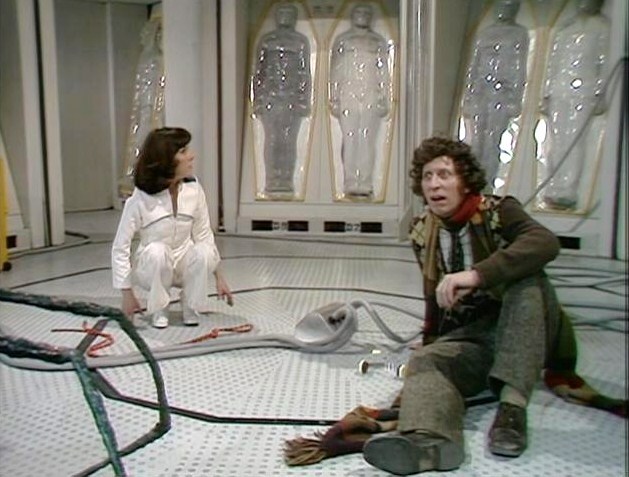 In Part Four of the serial, for instance, Sarah Jane Smith -- a reporter by trade -- leaves her comfort zone behind in more ways than one by transporting an electronic cable through an egregiously tight vent shaft. Like Vira, who becomes a sturdy and dependable commanding officer, Sarah adapts to the needs of the environment instead of sticking to one particular skill set. Rather than specialize herself into oblivion, she grows and changes. Again, this is gazed upon as an extemely valuable trait. Yet there's a yang to this yin, as well. An engineer named Rogan ultimately saves the day by releasing the docking clamps on a space shuttle containing the Wirrn. Before he does so, Rogan tellingly informs the Doctor "This is my job," with the emphasis on the descriptor "my." He meets his destiny by fulfilling the task he was trained to do. He considers that task an oath, as we can see from his self-sacrifice. Similarly, Noah retains enough of his humanity to also fulfill his training...as a leader. In this case, he saves the humans by deceiving the Wirrn into space; to the outside hull of the station. Uniquely, Noah has not only fulfilled his compact with the humans, he has also, in a very strange way "led" the Wirrn as well. Right off a cliff, so-to-speak. It's illuminating to consider that the humans and the Wirrns are both, at times in this four-part serial, led by one man: Noah. This means, I suppose that once a leader, always a leader, regardless of the species one commands. Once more, the idea being explored in "The Ark in Space" is training or career preparation as nothing less than destiny. "The Ark in Space" diagrams the debate between specialization and multi-tasking quite fully, without ever lecturing or becoming pedantic. The end point seems to be not that one approach is worlds better than the other, but only that flexibility and expertise are the keys to survival in any Darwinian struggle for survival. The humans (and the Doctor) do adapt, and fight back against the Wirrn. The same cannot be said for the bugs. The Wirrn continue to live by their biological life cycle (eat, absorb, lay eggs, then start again) and in the end that's simply not enough to make them the dominant species. Possessed of a corporate mentality, they cannot, apparently, resist from following Noah (their metaphorical CEO, I suppose...), into disaster. There must be learning and adaptation for survival, this serial implies. In terms of context, "The Ark in Space" is also fascinating because it reveals Dr. Who, along with Space:1999 (also premiering in 1975) at the spearhead of the movement to re-define space adventuring in darker, more grotesque terms than in previous TV efforts. In the late 1960s, Star Trek had beautifully and colorfully presented the idea of the United Nations in Space, with Cold War enemies such as the Klingons and the Federation, and each unaligned planet representing an island across a cosmic ocean, to either join the Federation, or team up with the enemy. By the late 1970s, the paradigm shifted. Space, in 1999 and the Hinchcliffe years of Who, no longer existed simply as an extended metaphor for East/West relations here on Earth. And at the end of the decade, of course, Ridley Scott's brilliant film Alien (1979) took the concept of outer space horror about as far as it could possibly go, with the riveting, gorgeously visualized tale of a "perfect" (and perfectly hostile) alien parasite. 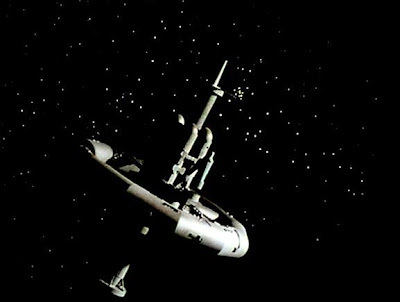 If one were to gaze at episodes of Space:1999 such as "Dragon's Domain" (with an alien octopus inhabiting a derelict space ship...) and "End of Eternity" (featuring a malevolent alien kicked out an airlock, when there's no way to kill him), as well as "The Ark in Space," which posits a parasite co-opting human bodies for the furtherance of its life-cycle, the "seeds" of Alien are quite evident. Today, one scene in "Ark in Space" forecasts Alien especially closely. Sarah Jane goes into that tight vent shaft, wearing a head-set "two-way radio," while in another chamber crewmen monitor her progress going from "juncture" to "juncture." At one point, Sarah encounters the Wirrn, but they are (safely) on the other side of a vent grille. In Alien, of course, Captain Dallas goes into the Nostromo's air duct, also wearing such a head set, and is monitored closely by Lambert and Parker, moving from "junction" to "junction." He comes to a much unhappier end, than Sarah-Jane. The point of this comparison is not to declare in any way, shape or form that Alien ripped off this TV show or that TV show, only that there was clearly something in the water in the 1970s, so-to-speak, moving space adventure in the direction of more dark, paranoid, chaotic imaginings. Perhaps it was the Energy Crisis that made all the difference: a global race for resources during a period of scarcity and market manipulation. In many of these dramas, from "The Ark in Space" to "Dragon's Domain" to Alien, it is man himself who becomes the ultimate resource for otherworldly beings; to be used up, and rather maliciously so. "The Ark in Space" sets the dark, ominous tone for much of Tom Baker's early tenure on Doctor Who, and so there's a chilling, unsettling atmosphere to the entire enterprise. In this story, man is dislodged from his home on Earth and sleeping in the ultimate "dark" -- outer space itself. And worse, there really are hungry monsters under the bed, just waiting to get him. "The Ark in Space" exploits this universal fear well, despite a not-very convincing Wirrn monster costume, and succeeds in being suspenseful largely because it is well-written and well-performed. 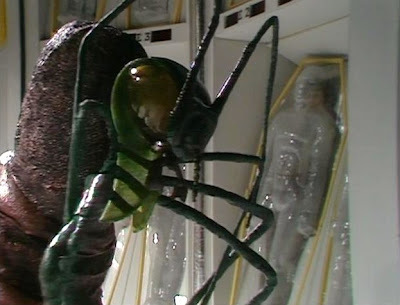 The Doctor goes on at length about the idea of being "digested" and "absorbed" by the Wirrn, and his colorful descriptions are more than enough to give those with a strong imagination a lingering case of the creeps. By 1975, Doctor Who had been around for more than a decade. But "The Ark in Space" is worth highlighting because it nearly feels like a pilot for a new series; a purposeful and efficacious re-direction of Who from its more action-oriented, earthbound, James-Bond-like Pertwee phase towards more ominous imaginings about outer space, and man's possible future role in that mysterious and unsafe realm. John, thoughtful review of Doctor Who: "The Ark in Space". This was the first episode of Doctor Who that I ever saw, as a boy, in the late '70s. It really was a great episode.